In the Swords & Soldiers universe Vikings are obsessed with barbecue and spicy food, which is a curious spin on history if ever we've seen it. 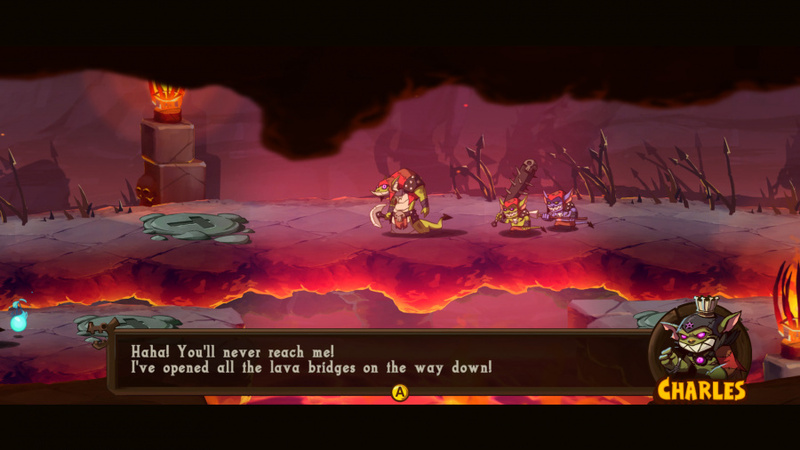 Such is the nature of this cartoonish and lighthearted franchise, which now receives its second entry as a Wii U eShop exclusive. Swords & Soldiers II is as complex a proposition as the most powerful chilli, however, as it's both a major superficial step forward from the original, yet has the same beating heart beneath its armour. 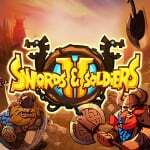 Swords & Soldiers was an excellent title in the brave new world of the Wii Shop, in a time when the idea of download-only games and small 'indie' development studios publishing on consoles was still a novelty. It eventually branched out to smart devices and PC, while third parties took over from developer Ronimo Games to produce a wonky 3DS port and, more favourably, a slick Wii U HD port. It's been around the block and is a concept very much at home on a touchscreen or TV - it's real-time strategy grilled down to its most simple aspects. Swords & Soldiers II shares the same basic concept as that predecessor - 2D side-scrolling real-time strategy. Your task is rapid resource management as you work to accumulate gold and mana - the latter is used for casting magic and spells - which are used to research and deploy an increasingly diverse range of units. When it comes to offensive units your control is very limited, as most simply march to the right and engage with any enemies they encounter, while you do your best to group them together or build walls, towers and even bombs to assist their attacks. That's the ongoing contradiction - in a positive way - at the heart of this Ronimo Games creation. At times it can feel like there's little strategy at all, and one tactic can be to simply overwhelm your foe with superior numbers, yet as you progress through the single player campaign you learn that bone-headed charges end in disaster. 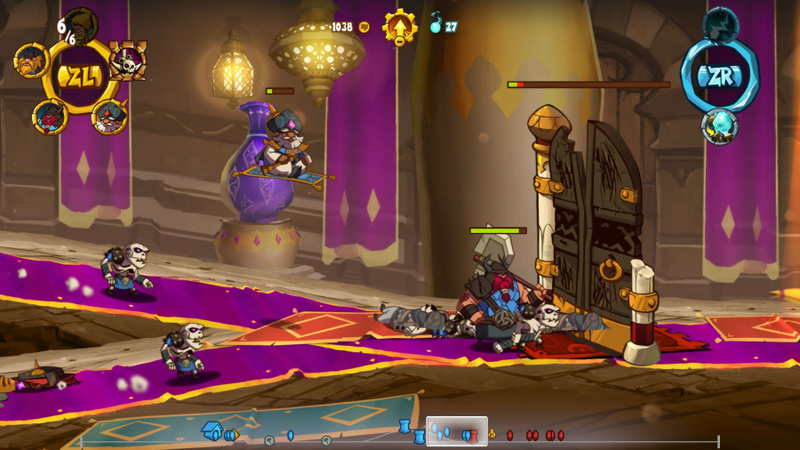 This frantic strategy, such as it is, has clearly been carefully crafted and honed by the development team, and figuring out the quirks of melee and ranged units is vital. There are obnoxious - again, in a good way - units that fire 'spirits', balls that explode into small fighting ghosts that can grind opposition progress to a halt, yet their fire-rate is slow and they're weak when attacked. As a result they need to be protected carefully in order to be potent, while on the flipside getting near them in opposition needs you to stack up on range fighters or strike with magic attacks. It can, at times, be overwhelming, though the campaign does a good job of introducing new elements at a sensible pace, and working through this single player mode is necessary to unlock some truly terrific and humorous units. With a linear storyline that incorporates Vikings, Persians and Demons - though you're always on the Viking's side - you get to experience and use armies from both sides, and there's excellent creativity as a result. From a 'robust' Viking woman that sings to speed units up, to rampaging units that clatter across the whole battlefield, the experience ramps up and continues to throw up surprises. Naturally, an unavoidable topic at launch surrounds the 'value' of this title, which has a premium price on its arrival. Ronimo Games has been good to its word in terms of promising decent bang for your buck - we initially blitzed the core campaign in around 7-8 hours, but in the process ignored a lot of medals and a handful of bonus battles and challenge stages. With extra stages on the map you eventually have 25 stages to tackle, each with three medals to achieve through meeting certain criteria. Some of these are fiendishly difficult and reserved for the finest quick-minded strategists, and it can add a lot of hours when trying to pursue a 100% record. Beyond the campaign are two extra modes. Skirmish is a single player option that allows you to set up your own custom battles against the AI. You can choose one clan's unit types, randomise or even set up a custom army, which is a fun way to combine the 'best' units from across the three groups. There are 11 stylish battlefields to choose from and you can even mess around with other settings, such as the game speed and the level of gold and mana drops that'll occur during the game. 2 Players is basically the same deal but allows you to go up against a friend. Player one is always on the GamePad and its screen - we'll come to controls shortly - while player 2 focuses on the TV screen. In a humorous test scenario we introduced a new player to the GamePad's touch screen controls in a match, taught them how to play and, before we knew what was happening, were getting blown away and defeated. 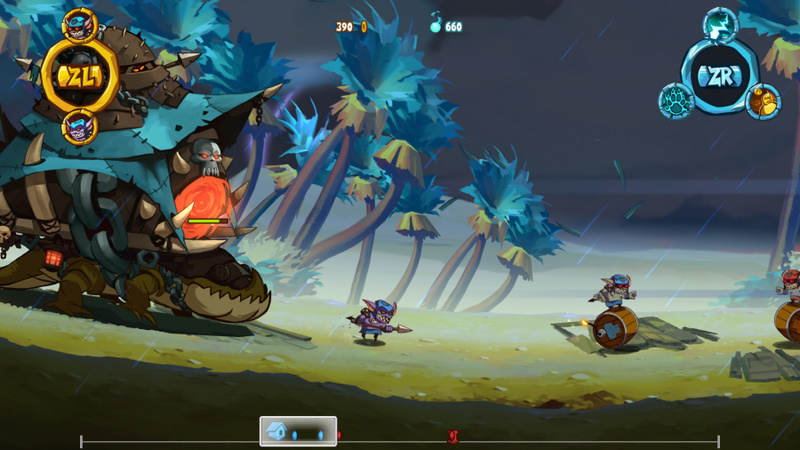 There's no mercy in Swords & Soldiers II. It's undoubtedly fun playing family and friends, though, and in having one screen each it adds welcome strategy and secrecy - the 'fog of war' stops you from seeing too far ahead of your furthest forward unit, after all. Now, controls. Unlike the Wii U HD re-release of the first game you don't have the choice of using the Wii Remote in single player. The GamePad is mandatory, but is used to offer two distinct control options that can be swapped out instantaneously at any point. The touch screen controls are familiar from smart device versions and that Wii U port of the original, as you tap on icons and swipe to get the job done. We recommend the new dual-stick option, however - though baffling at first, it develops into an intuitive and effective control scheme, with the bonus of really being able to focus on the TV action. You hold ZL or ZR to access wheels to build units or summon magic options, while a tap of Select takes you to the all-important upgrade menu. Both the touch screen and the new controls work nicely, with the latter having the benefit of allowing you to enjoy the TV view. When you switch to multiplayer, meanwhile, the second player can utilise the dual-stick controls with a Wii U Pro Controller or Wii Classic Controller / Pro, while Wii Remote and Remote + Nunchuk options are also there as expected. 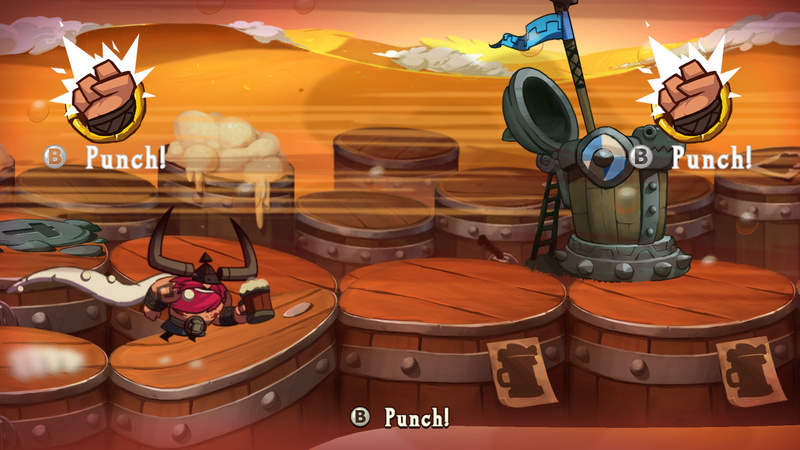 Overall the game covers all bases, with the only exception being the absence of pointer controls in single player - the pointer is, however, arguably the least effective and accurate option anyway. Another reason we grew to enjoy the dual-stick controls, beyond the fact they're implemented nicely, is that we could enjoy the visuals. Ronimo has produced truly gorgeous hand-drawn animations that are streets ahead of the first game. It's an all-new visual style and it flows and pops like a stylish cartoon - the hue is a little darker and there's notable detail as you go through varied and handsome environments. It's one of the best looking eShop games we've played and, importantly, runs particularly smoothly, barely dropping a frame. The soundtrack also deserves credit as it whimsically plays away, bringing drama and light-hearted tones depending on the mood of the game. 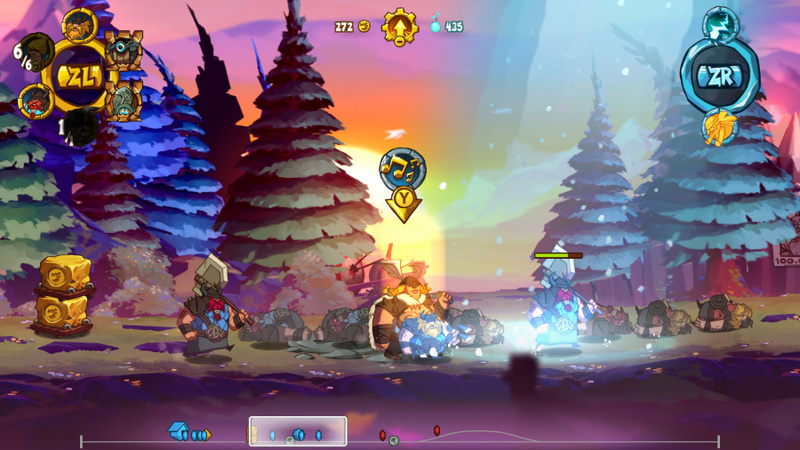 Swords & Soldiers II delivers, then, and is a testament to the developer's attention to detail and clear passion for the project. The only issue we take is one that won't be avoided in its current form - the nature of the strategy on offer. As we've suggested earlier in the review, it's an occasionally chaotic experience that's perhaps best enjoyed in short bursts, and a few stages become complex formulas with a small number of winning strategies. One such stage is essentially a timed race, and felt more trial and error than strategic battle; the counter-point is that failing a stage does open up an 'Easy' option, though you don't earn any medals when completing a stage in that difficulty. As a result it's a title that's deep in detail in terms of unit types and their impact on a battle, yet also simplistic and prone to becoming a war of frenetic overcrowding. In one late stage our unit options and resources were so limited that we engaged in a 55 minute battle - they're typically under 10 minutes - before eventually fighting all the way to the right. Just occasionally, then, the 2D strategy formula can be strained, though these are rare instances and niggles in light of what is, nevertheless, a hugely enjoyable title. This is certainly a welcome addition to the top tier of Wii U eShop games. Big fan of the original, glad to see the years of waiting paid off, I'm loving it! I hope people don't wait for a price drop. I am waiting to actually have money but I totally want to buy it at full price. I'll buy this when i have money for it. I hope everyone else does the same. With all my recent purchases and many more to come sorry i have to wait and wait for a sale. Raising a family of 3 doesn't come cheap. I am not into strategy so I will most likely skip it. But it seems the devs polished it and they are charging for it. Like the artists of old who could charge more for a painting as they got better and more popular. Interesting. If I had any sort of reliable income I'd snag this. The original was pretty fun, all things considered. I got it, loved the first one and will love this one, I'm sure. Will get down the year. @ULTRA-64 The game has both objective based medals and time based medals. I spent 10 minutes on the prologue level alone trying to get the objective medal (wipe out an army using the demons meteor attack because I always JUST missed one guard - LOL!). Very satisfying gameplay!! @HAL9000 that's more like it! I really enjoyed the first one but I felt no need to go back to it unlike castlestorm for example which I got way more out of. Cheers . If I didn't have a huge backlogg I'd probably buy it now but will wait as I'd rather not senselessly spend more than I have to, sounds like it will be a blast though can already see local multi being a hit. "we engaged in a 55 minute battle - they're typically under 10 minutes - before eventually fighting all the way to the right"
That's nothing, first time I played the original the last battle took me 3 hours. My wife can attest, I missed dinner, but I was determined. Turned out there was a simple thing to do and I misunderstood the directions. 2nd and 3rd time thru - I played it on easy, normal, and hard - it was much much shorter. "We recommend the new dual-stick option, however - though baffling at first, it develops into an intuitive and effective control scheme,"
That's almost exactly word for word what Ronimo said when they ported the 1st game to PS3. I tried that demo and found it almost unplayable. A few months later they patched in Move support, so it played just like Wiiware, only in beautiful HD, so I bought it again, b/c by that time Wii games were hard to look at w/ my PS3 hooked up to the same tv. For anybody on the fence who hasn't played the first, it's only $3 on Wii U, you can't go wrong at that price. @sinalefa - Still undecided. Nothing in this review makes me think it's all that "new and improved" over the first to justify doubling the price from the original, or the HD PS3 version w/ both Move and ZR ZL control options for $10. And I'm still annoyed the Wii U version never got the "sausage" DLC thats on Steam even though Wii U got the game years after the Steam DLC came out. I'm guessing in 2 or 3 months they'll patch in Wii pointer support for single player, which is my preferred way to play, and I'll pick it up then. Who knows, by then maybe Nintnedo will finally have it's new "club" up and running so digital game purchases mean something special again - %, coins, stars, something. My game downloads feel so naked w/o something. It may not be a strong reason but I'm skipping this one because of NO ONLINE Leaderboards or Multiplayer , I do like the new look- yet like @rjejr stated I agree Nintendo REALLY REALLY NEEDS their club up and running . I'll be buying the first one to see what the series is about. Call it a test-drive. This game looks gorgeous. I'll definitely be checking it out down the road, but I'll probably start with the first game since it's a cheaper entry point. Having played it a bit yesterday, there's a lot more finesse in this game on almost every level. I hope online multiplayer will make it in at some point though. Picked this up last night since it looks accessible but challenging.am out for a birthday tonight but am looking forward to nursing ma hangover with this n some buckfast in the morning. @Doctor_Pancakes Not in the slightest. 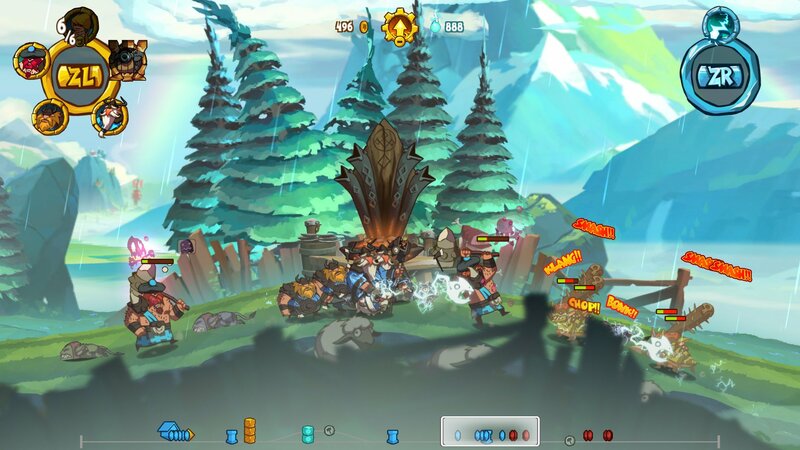 Castle Crashers is a Beat em Up / Hack and Slay while this is a strategy game with slight hints of MOBA gameplay. The Scottish man scares me. Aye! Tis lookin quite fun; so it is! This game's visuals really are super striking! Hope to get around to playing it over the summer. Something else to consider is that it's exclusive. I'm sure it won't stay that way forever- these developers almost always take their games to other platforms six months down the line, but it's a nice gesture getting it first. That's worth at least $5 extra to me. never played the 1st. Should i do that or this one? No Wiimote support in single player is a dealbreaker for me. I downloaded the first one, it was fun, but not worth the price, if I do get the sequel I'll wait til it goes on sale. The GamePad multiplayer is worth every penny for me. Having almost finished the game, I agree with the review mostly. One change from the first game that I'm a little disappointed about though is the campaign progression. The original divided the campaign up better by separating the different army types so each campaign had its own distinct personality. The campaign in this one blends the armies together and I never felt like I got a good feel on what each army had to offer. I'm also a little disappointed that there are only 3 armies again, and only the vikings return (and they're significantly different than what they were in the original). It helps that you can mix and match units in Skirmish mode, but I'd like to see the Chinese ad Aztecs back. Oh boy another 2D side scroller I'm just so excited I could burst. @JaxonH - "That's worth at least $5 extra to me." And if it was $5 more than the first I would have bought it day 1. Looks like a bunch of people have bought it, so that's good for them, but w/ so many good Wii U DL games going for $15 - Child of Light, Shovelknight and Guacemelee come to mind - not sure why they went for the extra $10. $20 is ridiculous for this game. I love this series and it's very fun and has high play ability. I bought the first game at $3 and thought it was amazing. It gave me hope that I don't have to pay more than $10 for a great game on the eShop for indie developers. Now I'm back to thinking that indie games on the eShop are overpriced again. I mean, what spiked its price so high? With $20, I'd rather just buy console game. @Spoony_Tech How can you say that Spoony_Tech. It was only last month you won the American lottery. What was it again, around the $70 million mark was it not???? Seriously, I understand pal. In that respect, I am lucky both my daughters are grown up and living on their own. They still withdraw from The Bank of Dad every now and then, but not too much lol. @umegames Absolutely get the first one instead. This one is crap.